Now re-branded and re-launched as Ambassador. We think they sound better than ever! The Funk Federation are a 6-9 piece funk and soul band who will take you on the funkiest musical journey from the 60s to the present day performing an amazing mix of timeless funk, soul, motown, disco and acid jazz which when fused together creates one of the strongest sounding, highly entertaining party bands available today. Each member of the band has extensive musical experience and brings with them their own charismatic personalities and unrivalled musical talents. The standard line-up of the six piece band consists of bass, guitar, drums, sax/keyboards, female backing/lead vocal and male lead vocal. From here the band can extend up to a nine piece by adding additional brass, percussion and backing vocals. The Funk Federation provide their own quality 3K PA sound system along with a full lighting show which makes them self sufficient in considering any event in the UK and overseas. The band can adapt to any venue from small and intimate to an outdoor festival. Potential clients can request any song and the Funk Federation can provide a premixed CD of the clients request to be played before, between and after sets to make the overall event seamless. 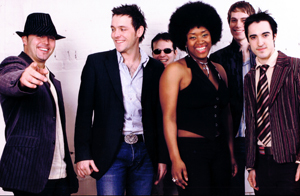 After forming in 2003, the band has performed gigs at private functions, weddings, corporate events, nightclubs, festivals and at venues including venues such as The Jazz Caf’, Butlins Soul Weekenders and Doncaster Dome. The Funk Federation have appeared no bills with artists such as Boney M, Rose Royce, Womack and Womack, Edwin Star and Jimmy James and the Vagabonds.